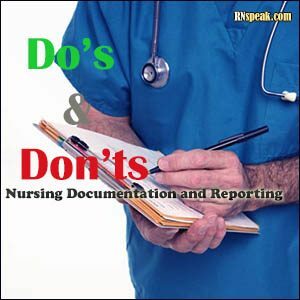 Nursing documentation is responsible for keeping the legal record of the patient, which is known as the patient’s chart, regarding his personal information and care. On the other hand, nursing reporting occurs when two medical professionals directly and indirectly involved in the care of the patient collaborate and exchange information about the care of the patient, either by personal or telephone conversation. What are the functions of the patient’s chart? It serves as a well-organized process of relaying necessary information from one care provider to another. It imparts important data about the patient’s condition. It will serve as legitimate evidence used even in court. The record can be utilized to assess the healthcare quality provided to the patient and the competency of the healthcare provider. The chart can be the source of information for the whole healthcare team to plan the patient’s care. It is not necessary to use complete sentences in charting. For each entry, begin with a capital letter for the first letter of the initial word and end the statement with a period. Use ball pen when writing any information on the chart. Avoid using felt pen or pencil. State only the facts regarding the care. The healthcare provider’s opinions or interpretations are not necessarily included. Correct: Consumed 2 Liters of water. Incorrect: Drank plenty of water. Additionally, use proper punctuation marks to quote the patient’s statement. It is important to include the objective data. Behaviors are noted instead of the patient’s feelings. The important and relevant information are the only ones noted in the chart. Charting entries should be uninterrupted and are only allowed to continue on another line if the entry is done on another time. Double charting is prohibited. Inserting additional data in between spaces is also not allowed. Further information is entered on the first available line. Place the full name and status of the healthcare provider with signature affixed on top of the name. In case of an error, place a horizontal line over the wrong data. After which, place the word “error” on top of the mistake and affix the healthcare provider’s signature. Handwritings should be readable and clear for others to see. Place horizontal lines on spaces to avoid others from inserting additional data on the nurse’s notes. All information stated in the chart should be kept private. The different individuals or departments involved in the patient’s care have allocated sections in the chart. The patient’s information are documented and organized in accordance to the origin of the data. The chart incorporates all the information regarding the problem as identified by the healthcare team. It is an organized and concise sheet regarding the patient’s information and care used during endorsements. It is available to all the healthcare providers involved in the patient’s care. It is mainly done for continuity of care. Aside from the information stated in the Kardex, other important data regarding the patient’s care is also endorsed to the receiving team. Registered nurses are the only ones who can receive and process telephone orders. Telephone orders are validated by relaying the information clearly and accurately. This kind of order should be countersigned by the doctor who gave the order in no more than 24 hours. This type of reporting is done when a patient is transferred from one department to another. Quiambao-Udan,J.(2004). Mastering Fundamentals of Nursing. (2nd Ed.). Educational Publishing House. Being a nurse-writer reflects both my profession and passion for my calling. I believe writing is the greatest way for me to promulgate the insights that I'm best with. Medical-Surgical Nursing and Anatomy & Physiology are my two strongest specializations in the field.